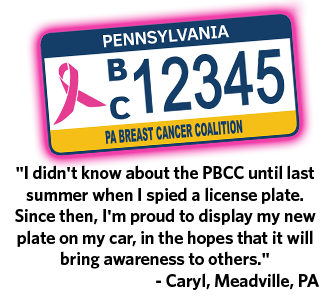 Pennsylvania’s breast cancer awareness license plate proudly proclaims your commitment to breast cancer awareness everywhere you travel! Plates can be ordered ONLY through the PBCC. The one-time cost of the specialty license plate is $50, which includes a contribution to the PBCC. Personalized plates are now available for $200! Download the short application now! Please complete pages 1 and 3 and submit them with payment to the address below. Please keep page 2, the Frequently Asked Questions, as a reference. If you lease your vehicle, you also need to download and complete an MV-1L form. Please complete this form and attach it to your license plate application. Please call 800-377-8828, ext. 2304 or email Tricia@PABreastCancer.org if you have questions or if you need an application mailed to you.